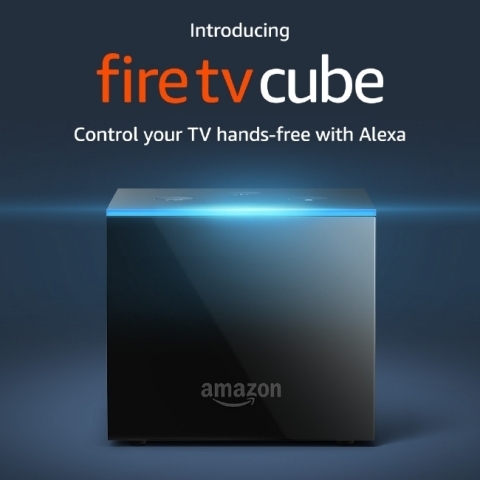 SEATTLE--(BUSINESS WIRE)--(NASDAQ: AMZN)—Today, Amazon announced Fire TV Cube, a hands-free 4K Ultra HD streaming media player with Alexa, allowing you to control your TV from across the room. Fire TV Cube uses multi-directional infrared technology, cloud based protocols and HDMI CEC, that—combined with Alexa—let you control your compatible TV, sound bar, A/V receiver, and cable or satellite box. Power your TV on and off, change the volume, switch to different inputs, and change the cable channel—all with just your voice. Even with the TV off, simply say “Alexa, play Billions on SHOWTIME” and Fire TV Cube powers on your TV and starts playback right where you left off. Plus, because the Alexa service is always getting smarter, Fire TV Cube is going to get even better over time. Amazon Fire TV Cube is available for pre-order starting today for $119.99 and ships with an IR extender cable and Ethernet adapter beginning on June 21. As an introductory offer, Prime members can pre-order Fire TV Cube on June 7 and 8 for a special price of $89.99—a $30 savings. Plus, for a limited time, customers can pre-order Fire TV Cube and Amazon Cloud Cam together for $199.98 – a $40 savings. Customers who purchase and register their Fire TV Cube by July 1, will also receive a $10 credit for Prime Video. And starting on June 21, Fire TV devices are eligible for unlimited access to tens of millions of songs with Amazon Music starting at just $3.99/month. For more information visit www.amazon.com/firetvcube.